Tap at Stadsbrouwhuis, Leiden: Slightly hazy amber colored brew with an dry bitter taste with hints of citrus, pineapple, caramel and pine. UPDATED: JUL 30, 2018 Vycap unorthodox. Vona citrusova. Farba medovocervena. Chut citrosova a kavova. On tap at Clock Block Ueey, I can taste how true San Diego is. Hazy amber with tall orange-ish head. Hoppy and earthy aroma, something like grapefruit at the end. Taste is hoppy bitter. Strong hop presence all around. Hoppy bitter tale. Perfectly balanced, enjoyed a lot. 0.4 l on tap at 'Be Unorthodox'. Almost clear, dark amber with a medium large, very dense, almost stable, off-white head. Sweetish, fairly resiny and just moderately fruity aroma of lots of pine, caramel and some orange jam. Quite sweet, malty, moderately bitter, heavily resiny and just slightly fruity taste of massive pine and caramel, accompanied by orange jam and some tea leaves, followed by a medium long, fairly dry-bitter, very resiny and gently grassy finish. Medium to full body, smooth, creamy to oily mouthfeel, soft carbonation. Nice old school West Coast IPA, rarely seen nowadays due to the NEIPA dominance and therefore highly appreciated. Tap at Unorthodox Bar. High bitterness, loads of citrusy, zesty hops character. Rather full body but kept drinkable by sheer force of hops. Good one. 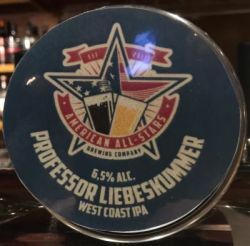 Tapped at Clock Block in Bratislava Slovakia. Pours a light amber color. Thick soapy head. Aroma of malt, caramel, slightly pine. Taste mirrors the aroma. Good hoppy bitterness. Strong piny flavor. Too much caramel for me. Why? Why so much damn caramel? I hate that. UPDATED: MAY 23, 2018 From tap at Damian Bottle Shop, Bratislava Pours almost clear apricot orange to amber liquid, huge frothy whitd to tan head, Aroma: fruity, apricot, pineapple, tangerine, slightly zesty- graprfruit , Taste: apricot, grapefruit, pineapple, mango, tangerine, Palate: medium body, averge carbonation, creamy mouthfeel, long bitter aftertaste, Overall: verg good IPA, lot of exotic fruits, enjoyed. Draft at Brody’s. Hazy amber with a cream coloured head. Aroma of resinous hops, pine, grass, dank notes and fruity stuff behind. Flavour is light to moderate sweet and moderate bitter. Medium bodied with soft carbonation. Aroma: Fresh hops, light grassy. Appearance: Cloudy light brown. Long lasting, white head. Taste: Light sweet, medium bitter, hops. Palate: Medium body. Bitter finish.